Of course I lost track of the photo, because Pinterest didn't exist and I didn't think it would be that hard to re-find. I mean it's a ROGBIV white tree. Wrong...I couldn't find it. Then a few weeks back I remembered this dream tree and I went to work on finding it. Low and behold...there it was and BAM I pinned it. Why did I go to all of this trouble you ask? Well because I wanted to recreate it. For someone who's always had a fresh cut tree (up until two years ago), this was an out of left field desire. I wanted...no I needed to have this tree in my house. So late last night the husband and I made a trip to the store so I could get my white tree. Getting me one step closer to to my dream. Then today I put it together. I just couldn't wait until after Thanksgiving. Wow. I am so in LOVE with the tree. It's better than I expected it to be. In fact I can't stop looking at it. It's exactly what I wanted and totally puts me in the mood for the holidays. Now to just get the other holiday decorations out. That is beautiful. What is amusing to me, is that in your inspiration photo, there are three paintings on the mantel. I totally just used them for inspiration of my own to create three large oil pastel canvases to go on my mantel. Too funny that two people looked at one photo and found two completely different things to inspire them to decorate with. Thank you! My husband and I actually love the paintings as well, but we don't have a fireplace mantle in the house so we decided to forgo them for now. I'm glad that you found inspiration in the photo as well! 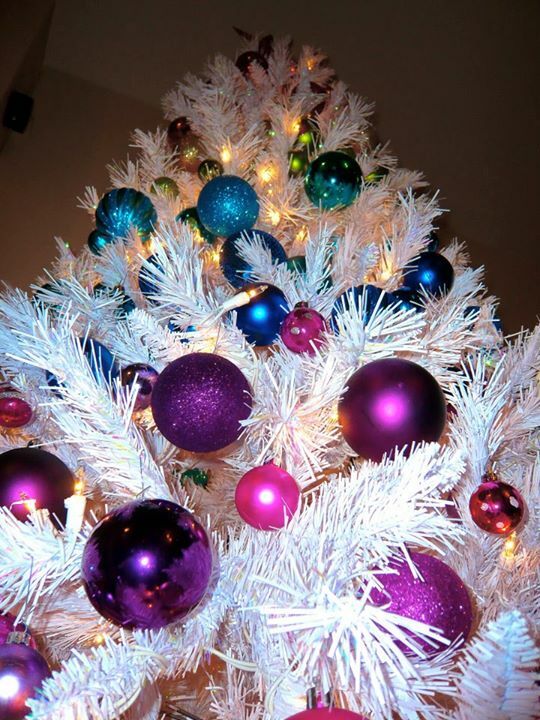 This tree is beyond amazing!!! Omg it looks pretty !!!!! Oh my! What a fun idea!! 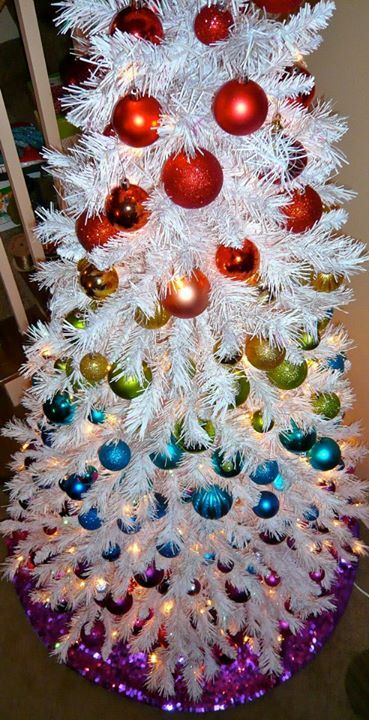 I love the white tree, too. It wouldn't look the same if it was an evergreen. I love this tree! 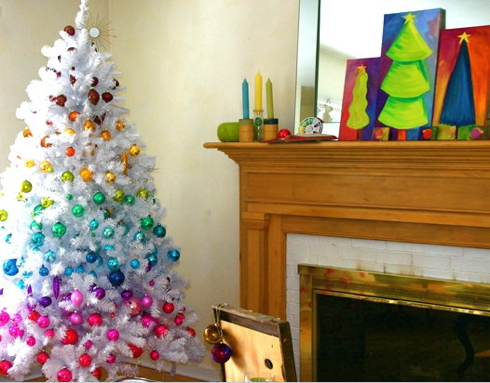 My little one is going to be over the moon when we do a rainbow tree for her bedroom next Christmas! And I would never have thought of it! Thanks so much! Love the tree!!! So cute and creative!!! I was just wondering what color of lights you used? And were they on a green or white wire? The tree was actually pre-lit so we didn't have to add lights to it. The lights are just the clear bulb on a white wire. We were actually able to purchase the tree for a little under $100. WOW! If I didn't live with a super manly-man, this would be in my living room right MEOW! Where did you get the star as I have been looking for something exactly like it??? I got it at Target last year. I think they are still selling them this year though!